Missing teeth are unsightly and prevent many people from smiling and leading an active social life. Missing teeth can also be a potential health risk. The good news is a dental bridge will replace missing teeth, restore your smile, protect your dental health and quite possibly may improve your social life. Dental bridges replace a missing tooth or multiple missing teeth. Intended to bridge the gap caused by missing teeth, a bridge contains an artificial tooth (or teeth), and crowns for the supporting teeth, all secured to a base. Bridges are favored by some patients because they are a less invasive treatment than dental implants and are considerably less costly. They are a fabulous choice for those missing only one or two teeth. How will I benefit from a bridge? Dental bridges act as placeholders for your other teeth. Gaps between teeth leave room for shifting which can throw your bite out of alignment; a bridge prevents this from happening. When your bite is off, other issues can develop such as jaw pain and excessive wear on neighbouring teeth leading to decay. What material choices do I have for my bridge? The most common material used is metal, and the most common metal used is zirconium. Though zirconium bridges provide comfort and durability, Santa Monica dentist, Dr. Ana Brightleaf prefers porcelain rather than metal to construct bridges. Metals can cause allergic reactions in some people; much like a ring that leaves a green circle around your finger. Not only are reactions a possibility, metal also leaves spots due to its dark color in contrast to your teeth and gums. Metals oxidize over time, causing them to break down so that they do not bond well to tooth surfaces. Porcelain blends seamlessly with your natural teeth and most will not even know you have a bridge. Very few people react to porcelain, which suggests this material is safer to use. How do I learn more about porcelain bridges? We prefer to use non-metal products in our Santa Monica dental office, as we believe natural products are better for your overall health. 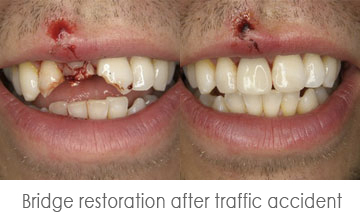 You can gain an insight on how a non-metal bridge can restore your smile by Scheduling a complimentary consultation.